i and several others have paid lip service to the fact that the majority of cycle shows these days resemble little more than several acres of carbon fibre. it is common knowledge that the bulk of the worlds monocoque frames are produced in three large factories in taiwan. though each manufacturer is at pains to point out that their own research and development is what makes the difference between their own carbon and that of their competitors, there's no denying that, aside from paint schemes, a lot of them look remarkably similar. however, it should perhaps also be pointed out that, just like the motor industry, many are the result of computational fluid dynamics and wind tunnel testing. if everyone's asking the same questions, there's bound to be a high level of similarity in the results. shiny, team liveried carbon fibre, however, fettled to within a millimetre of its life by a team of highly trained mechanics really is rather impressive. though making every effort to adhere to the uci's 6.8kg minimum weight limit, today's race machines are sleek and pared to the minimum, particularly those destined for the alps or pyrenees. jacques anquetil was well noted for removing the bottles from the cage and placing them in his rear pocket in order to improve his skills as a grimpeur. presumably he was absent from school the day gravity was discussed in class. while carbonsports, only a few years ago released a pair of their lightweight wheels that were specifically for climbing prowess, reputedly because they featured no braking surface. presumably this was one of those situations that required a change of bicycle at bottom and top of the climb. 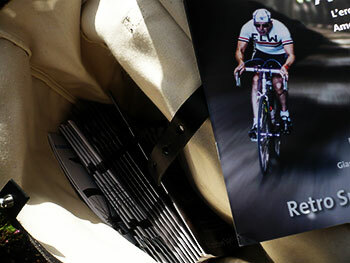 in the face of the above, it would not seem too unkind to suggest that the modern-day racing bicycle is somewhat limited in its practicality. i seriously doubt that alejandro valverde nips down to spain's equivalent of tesco on his canyon race bike when mrs valverde realises they need a couple of pints of milk. heaven forbid that he would have need of purchasing sufficient food for any dinner parties the valverde's may throw, of an evening. for the relatively mundane day to day existence, something a bit more realistic would seem to be in order. in terms of bicycles, i find that my taurus corinto fulfils the bulk of this ideal, with its sit-up-and-beg riding position, comfy brooks b66 saddle, balloon like tyres and sidewall operated dynamo. for cargo carrying necessities there is a substantial, tubular steel rack over the rear mudguard, a device that promises much but, to be honest, on its own delivers rather less. though it features a large spring clip, to hold items in place, you really wouldn't want to place a box of large size, free-range eggs underneath it. 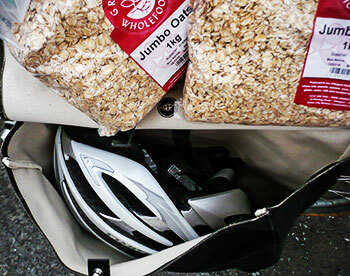 nor indeed, would two bags of green city jumbo porridge oats fare too well between here and bridgend stores. ideally what is required is some sort of bag or box that would fulfil the functions demanded by the latter two foodstuffs and many another, no doubt. however, i'd really rather utilise some form of cargo bay that sullies not the italian beauty of the taurus, something i fear a wooden box or crate might do to a greater or lesser extent. 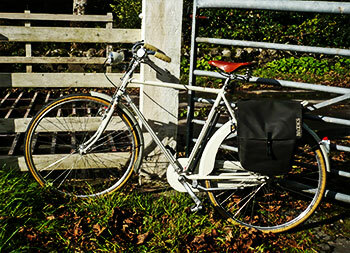 and generally speaking, panniers look perfectly fine on a dawes galaxy on its second circumnavigation of the world, but to be honest, i was thinking of something less industrial looking but a tad more bohemian. 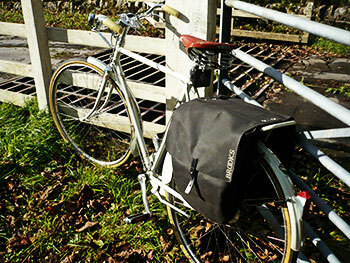 the answer is, of course, a pair of brooks brick lane roll-up panniers. these are fashioned, in typical brooks style, from a heavyweight waxed cotton, offering a brownish-green to the outside world, but a natural cotton look to all of your cargo. 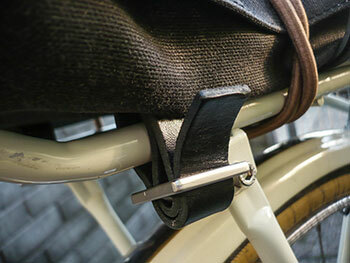 each pannier is rolled up and sits on top of the eyeletted joining panel, held in place by a brooks bungee cord, threaded through a brooks leather buckle (for want of a better word). the panniers' top flaps also fasten to a chrome popper attached to the underside, preventing them from loosening over less than pristine road surfaces. the whole affair is held onto the rack by means of four small, leather buckles attached one at each corner of the panel, each wrapping round the rack's outer tubing. they can be safely and aesthetically left in this manner until such time as shopping becomes a necessity. i might also add that i have now somewhere more appropriate to store a spare inner-tube, tyre lever and wheel bolt spanner, than scrunched in the back pocket of my jacket. since my middle name is fumblefingers, i have determined that it makes more sense to unfurl the panniers before returning with two full carrier bags (5p each in scotland now) in need of transportation. it's probably as well to leave the shopping inside those bags. though the waxed cotton quite likely offers adequate waterproofing, the top flaps are a casual fit when closed, leaving gaps in the firmament into which precipitation can easily fall. i cannot deny that i was very impressed with the carrying capacity offered by the brick lane panniers. they arrive rolled up inside a card sleeve, and until they have been unfurled when required, give the impression of being rather modest of means. not only that, despite being held in place against the rack legs by any manner of means, they remained steady throughout my three-mile journey from bridgend stores on each and every occasion. it is quite prudent to site the panniers as far to the rear of the rack as is possible, in order to avoid rubbing your heels on overstuffed fabric, something accomplished with ease on the taurus. for additional safety of carriage, there's a leather popper fastener to close over the top of each pannier, and another to close the outer flap over the top of that. and in the finest manner of school books, there's a this belongs to legend under which to write your name. hopelessly optimistic, but a nice touch all the same. for a family of four, cramming in a weekly shop would be quite out of the question, but since mrs washingmachinepost and i are the only two left on the croft these days, capturing a couple of days' worth of food and provisions gave little trouble. and cycling homeward with only three sturmey archer gears for company, offers an extremely beneficial effect on those chris hoy thigh muscles. i did have some misgivings as to the effectiveness of the brick lane panniers when first fitted, partly because i had not realised their substantial capacity, but also because the operating instructions were less than clear. i feel i'm not letting too many cats out of the bag by admitting i had originally fitted the panniers upside down and completely missed those four little leather fitting buckles after i'd realised my mistake. as with most quality products, and brooks are no exception, the brick lane roll-up panniers are reassuringly expensive, but the build quality and design ethic go a long way to compensate. not only do they look as if they were made for the taurus, but i love them. brooks brick lane roll-up panniers retail for €185 (approx £146) and can be purchased from any brooks authorised dealer. 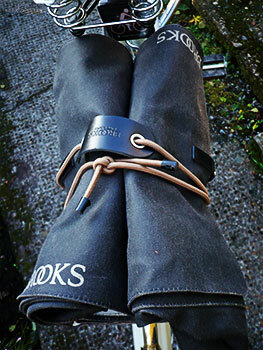 brooks products are distributed in the uk by extrauk.